The surface water temperature has cooled from almost 75 degrees to about 70. There is a "bite window" that has been occurring between 8:30 and 10:00 A.M. The Eagle Lake Trout are feeding on minnows. The weather is great and there has been a pretty good later morning bite. Troll water that is 50-60 feet deep. Those with downriggers, set your baits at 16-30 feet deep. For those trolling leadcore, use 4-5 colors. Troll around one mile our. Best baits include Sep's #2 watermelon and brown grubs. Red/gold or red/white spoons as well as night crawlers will also work at the same depths. Best trolling areas are Miners Bay on the east side of the lake and Shrimp Island on the west side. Move your trolled baits up or down in 5 foot increments until you find the best trolling depth(s) for the day. The fish are all over the vertical water column gorging on the tui chub minnows. Bobber fishing has been very, very good. 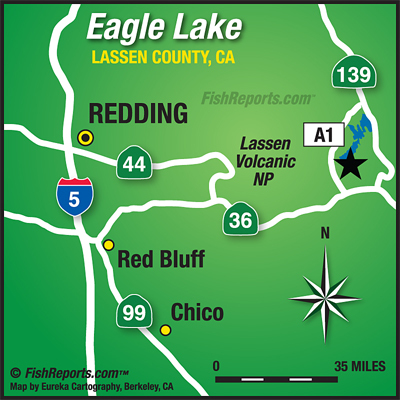 The Miners Bay and Eagle's Nest areas have been consistent good spots for the bobber fishermen. Set threaded night crawlers below a slip bobber at 30 feet deep.